Overall: I just wanted to say how I continue to be pleased with the services of Orbund even now at a different level. My most recent positive experience is related to discussions in classes. In some of my classes, I use discussion forum, however I did not like the fact that I didn't know a student had posted a comment unless i checked the class. I therefore contacted live help. I was told it was not possible so I should report it to my administrator who would seek to have this feature included. To my pleasant amazement, the next time I logged in, before even speaking to the Administrator, I could see recent discussions on my start page. That is so very helpful. This experience reinforced what I already know - Orbund is limited only by the limitations of my imaginations! Thanks again and please convey my thanks to whoever it is really due. Recommendations to other buyers: For best results,know what you want and communicate it to your customer service person. We have been an Orbund customer since 2010. We had a complicated implementation (our programs were somewhat unique) but the team was very accommodating. I have suggested that a Business Manager who can sit down with the potential customer and walk through their programs would be helpful to determine the best set up and usage of the Orbund product. I think our initial understanding and training of the product was not thorough enough for us to work through issues without further assistance. Once we were live the customer service team headed by Kaniz (who is very knowledgeable) is always pleasant and helpful. We had weekly meetings for a season and Kaniz and her team continue to be responsive when we have questions or issues. We are made to feel that meeting our needs is their main focus. Kaniz and her team are a delight to work with. I think a more thorough initial training (additional training materials, etc.) would help the client understand the system better and maybe some issues would be avoided or nullified. I would like to see a more vibrant live help with follow up emails or phone calls confirming that the issue has been resolved and how. 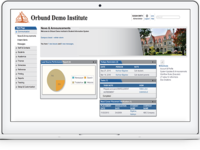 The Orbund product has all the elements that we need to manage our school; student records, financial, course management, etc. Over time, It is evident that Orbund continues to improve its product with new features, updates, etc. always endeavoring to meet the expanding needs of its customers. I know it might be difficult, but it would be helpful to have a "heads up" when new features or changes are made. Comments: The Orbund management system has become an essential member of the team at the Office of Registrar at our college. We especially love the fact that it is customizable to our needs which are unique and evolving as we are a relatively very young educational institution. It appears to us that the only limits Orbund has is that of our imaginations. As our needs are identified the product is modified. This makes managing our student information system much easier. We have been discovering that the system can do more than we actually use - for example we recently used it for our admissions process, helping in making our office green. We have gotten rid of much of the paper work associated with admissions. Orbund also keeps college community connected as it is used to communicate to all - students and staff alike about various matters. It allows for multi-dimensional communication as users on the system can communicate with each other. We believe that one of the strengths of the system is the excellent customer support! It is amazing their availability - by whatever medium most convenient for us at the time - they make us feel so important it is almost as if we are the only client (which we know is not the case). Our customer service rep has become as a member of staff. Her name is a well know and we speak of her as if her desk was within our physical space. We look forward to a continued relationship with Orbund management system. Our experience continue to improve with the minimal down time for system upgrade becoming less and less. 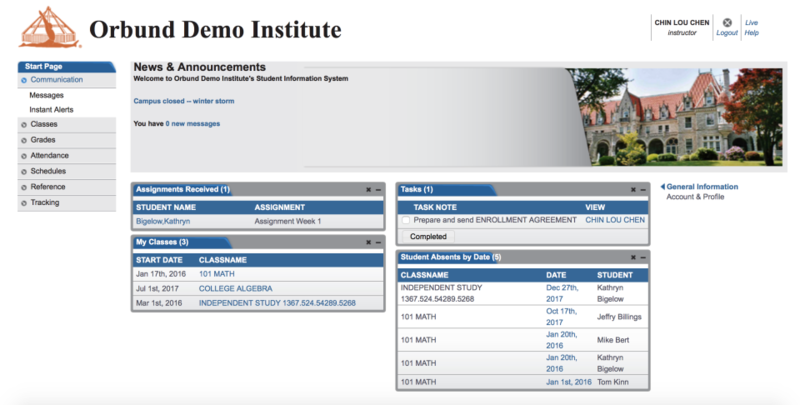 The Best Web-Based SIS/CMS Service for Institutes, Colleges, and Universities! 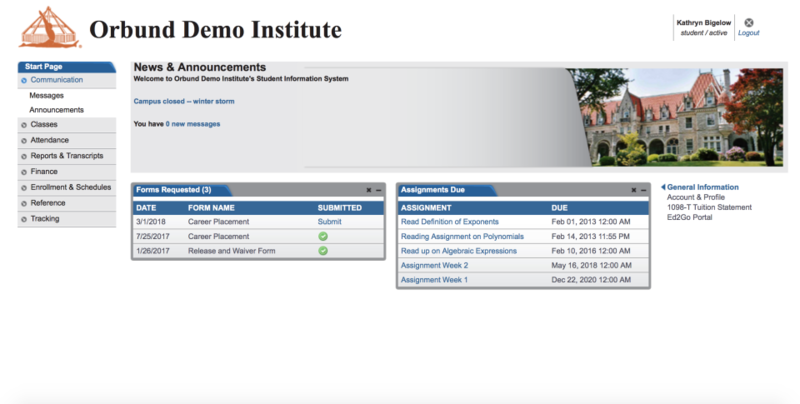 Pros: Great Interface and features that were desperately needed for the Palmer Institute. 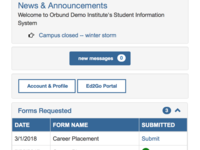 For example, the Multi Language capabilities, Calendar, Access and User Permissions, Communication Modules, Fee and Tuition Set up as well as the Semester Set up, among many other features were instrumental in going with Orbund. What's more, all the variables regarding setting up Courses/Classes proved to be extremely useful because we have certain Departments that have required courses/classes in order to advance to the next Level etc... Lastly, Instructors love to use the Grading feature and their Live course/class outline as well as the abundant of interaction they can have with students through Orbund. Oh, I forgot - Orbund is completely Mac compatible! Cons: The only con I would have is to make the Financial Module more user friendly. However, with the recent updates, the Financial Module is much, much better than before. Overall: Overall I would strongly recommend Orbund, without reservation, to Bible Colleges, Bible Institutes, as well as Universities and Colleges who are on a budget regarding their Web-Based SIS/CMS System. What a difference this software has made for the staff, instructors, and students @ the Palmer Institute! We can't live without this software now, especially because it is simply the best on the market. Comments: From launch to implementation ORBUND has proven to be an excellent educational management tool Although in the beginning there was a glitch in setting up administrative and teacher training sessions, those issues were quickly resolved by a responsive and capable support staff. As an administrator I immediately was sold on ORBUND- after the initial training sessions with teachers it was an easy task to sell ORBUND to them. The idea of having teacher records including report cards and transcripts, assignment grades, attendance, disciplinary actions, contact information and sending messages to parents and students then be able to store these on a server is a powerful tool. It has made my job immensely easy. 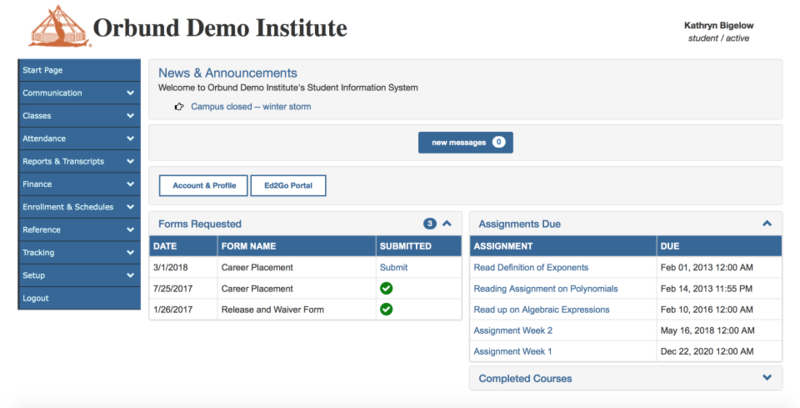 Having a repository feature sets up a structure where future administrators can access important documents that are readily available. ORBUND is not a system where you can learn everything about the program in one session - the more you use it the better you become at navigating its dashboard and the more useful you see its potentials. The real value with ORBUND is the customer service feature. I can only speak for my experiences as a sub-Administrator (Principal)who use the system on a daily basis- when mistakes are made by teachers and myself help from ORBUND's technical people is there to guide and assist at every turn. I give ORBND five stars without reservations. Pros: This is our fourth year of using this system and I have no complaints. Why? Cons: The only drawback is that we did not find this system earlier. Overall: This is a system that is worth investing in. I say so because it is more than just a system; it is like a relationship. The support that is given is exceptional. What is unique about this system is that it is tailored to meet our needs and the technicians have not just designed a system without flexibility. We are allowed to make suggestions, express our needs and see the system designed to meet these needs. It is a very reliable and dependable system. Our staff and students repeatedly express satisfaction with the system. I have no reservation in recommending this system. Overall: Our institution began using Orbund two years ago. 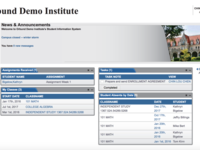 This software is a great tool for managing our academic and enrollment records. Because the system is so easy to navigate, it has personally saved hours of my time (in the role of registrar) finalizing a day's work that were once lost to our former database. Hours!! I am still amazed at how quickly I can wrap up a process in Orbund that used to take much, much longer in our old software. We found the Orbund team to be both professional and accommodating from the start, and our relationship with this team continues to thrive. Over the last two years, they have made adjustments to better suit the specific needs of our institution. With every little tweak in Orbund, I am only convinced more of its ease and effectiveness. I would highly recommend this system. Comments: I work for The Rock Church and World Outreach Center and have been working with the Orbund program in several capacities for close to three years now. The Rock Bible College obtained the software program when I was working in the Finance Dept. My duties at that time were to set up the students financial accounts, run payments, run reports and maintain records. Since then, I transferred into the Bible College Dept as the Registrar and Assistant to the Director. At this time I had to learn all the other aspects of the program. Kaniz and her team have been phenomenal to work with. Kaniz spent quite a bit of time training me over the phone in "webinars" and Laura and the support team have always been there to help me with challenges and resolve issues. They are competent, helpful and always friendly at the same time. It is my pleasure to be working with Orbund and the team. Comments: We are a unique case, being a homeschool co-op rather than a school. We only meet one day a week and our teachers are independent contractors. We searched for several months to find a school management system to handle our 300+ students and 60+ teachers and staff as well as our parent volunteers. The team at Orbund worked tirelessly to tweak their system so that it would function according to our unique needs. They copied our data from our old system over for us and helped us with setup and training. We are very happy with our transition to Orbund. It's a clean looking site, easy to understand, and easy to utilize. It makes the registration and enrollment process smooth and effortless. I recommend it. Comments: Orbund, like any online tool, takes some time to adjust to. Over the years our school has been using Orbund, we have been able to tweak it to fit our needs in terms of report cards or grading. We do wish there was more we could personalize but in comparison to other online school management systems, we have had the most flexibility and ease of use with Orbund. There are points of improvement with the service which we have informed their customer service team about and they do try to improve upon them. The team has become much more responsive over the years and much more timely in their assistance. Our school looks forward to using Orbund for years to come. We needed reliable transcript services and got more than expected. Comments: As the director of a small college prep boarding school, New River Academy, I researched transcript programming easy for staff to learn, functional and within our tight budget. We actually thought we would buy transcript software until we discovered Orbund. 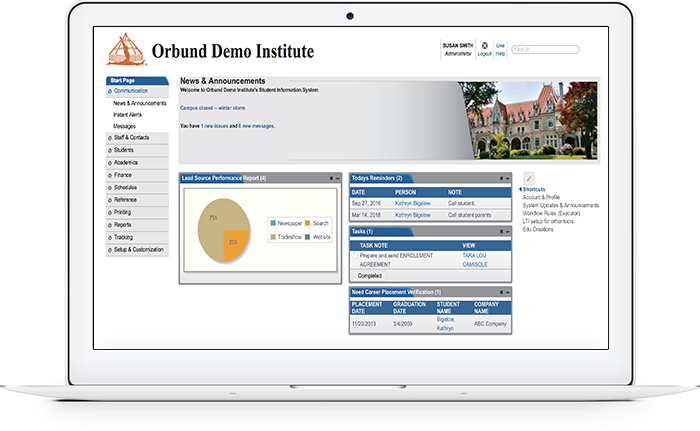 Orbund provided our primary need with transcript generation as well as became our solution for student records, invoicing and grading systems. Tech support was always available and easy. Learning the program was straight forward and functional. And most importantly Orbund gave New River Academy another level of professionalism at an economical rate. 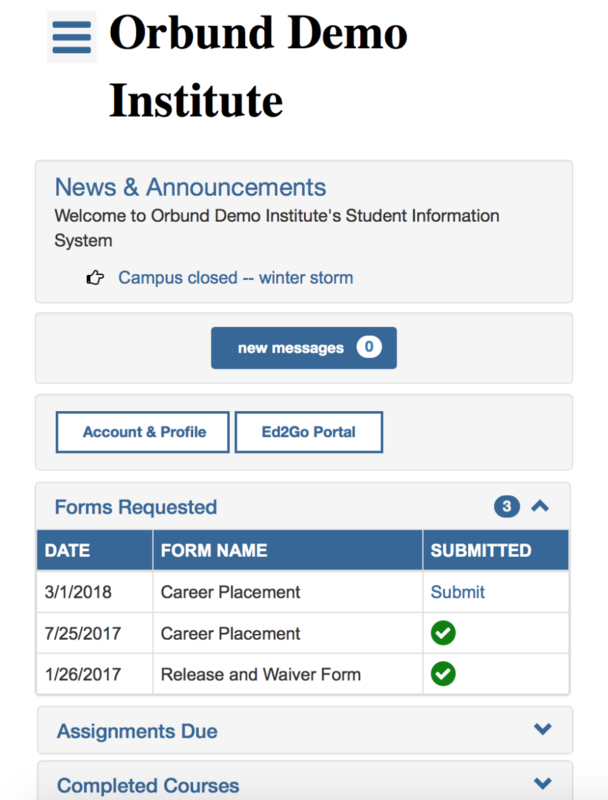 If you are an administrator then I highly suggest considering Orbund. Comments: Overall, Orbund is a great tool for our small, private school. I have used other education software going on 17 years now, so I am familiar with what this type of program is capable of. But the best part of the company would have to be its customer service. Previous companies would put you on hold for 30-45 minutes just to get a question answered. My customer service representative, Laura H., is WONDERFUL! I rarely couldn't get her on the phone, but if I did have to leave a message she called back promptly. She is always pleasant and extremely helpful and knowledgeable. Thank you, Orbund, for having employees like Laura! As Principal, I feel the product makes the school look a lot more efficient and professional. Comments: You actually have to use it and experiment with all the features to realize its full potential. My challenge is to get the teachers to use all the features on a regular basis. They rely too much on hard copy for communicating with parents. I'm still trying to figure out how to attach a document received in my email to a message sent out via Orbund. Maybe I should save it as a document and then attach it? Orbund's Customer Service is its greatest strength. I'm very impressed with Laura. Kudos to LAURA!!!! Comments: ORBUND, is education and student management tool. it is user friendly and extremely useful. the people behind the product provide outstanding help and support. 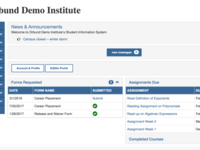 From teacher standpoint it is a comprehensive system from lesson plan to assignment all the way through grade book, announcements, messages and alerts. Also, administrators find this system very helpful. Our life at the school will be much harder with it. Comments: I've had a lot of concerns with this product. Customer service is not available in the evening EST time so Distance Learning students have difficulty getting help. The product is simple to use. The processes are confusing and long. The permissions in the system are limited and do not allow for multiple roles on single sign on. Financials are weak. Requiring you to touch every student account. This school is a special case. They don't have dedicated administrative staff for operating the system. We have provided free training every time we have been requested. The commenter was trained for instructor role, but she has been working as administrator also without training by us. The client requested live support at night. We made special arrangements for live chat support after 9pm. We believe the separate roles for user login makes our system more secure. 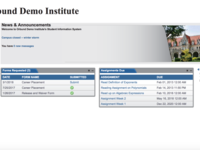 A Great student information system at a perfect price! Comments: I would personally have to say, I do not have any cons for Orbund. It is a truly reliable software that keeps on improving with customer suggestions, as well as great software engineers. I would rate the customer service with an A+++ and I would also add that it is extremely user friendly, almost intuitive! And it all comes an affordable price for the school, college or university that it serves. Comments: Orbund did a good job for our company. They were very helpful and had god attitudes. The owner is a honest and hardworking person I enjoyed working with. During the time we used the system, they made numerous custom updates for us that met our unusual needs. I would defiantly recommend Orbund to other companies. Comments: Orbund was a ground-breaking implementation for our small school. Since we first started working with Orbund 7 years ago, they have increased their commitment to customer service and have been very responsive to our service requests. Having access to the online chat has been invaluable. Comments: Orbund Software is so helpful and user friendly. As a small school we feel that for the price, which is very affordable, we get great service. The software is easy to manage and maintain student records as well as financial documents. We strongly recommend this program to any school, big or small. Comments: Our rep has always been great and helpful but the product itself have reporting limitations. Their customer service is excellent. They help you to cater your needs and modify templates. Comments: It is a good program for teachers, administrators and teachers. Very incomplete and inaccurate development! Pros: The sales cycle was great! Cons: Orbund seems to be pretty much a one-man operation with that one man being fairly overwhelmed. The product has had numerous inaccuracies and significant, baseline features incomplete. Overall: Do NOT recoomend Orbund! Very dissapointed in the prolonged, problematic implementation!